Prior to the regional challenge, the five winners did not know each other as they registered themselves for the initial online screening process separately and individually. They were selected from a pool of resumes and informed by the orgnaniser to form the team on the competition day. 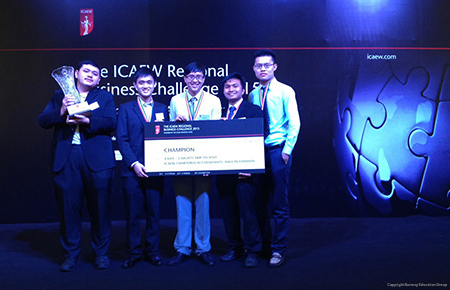 Team Sunway competed against 25 other teams from Malaysia, Singapore, Indonesia and Vietnam in an intense environment which simulated the real work of a chartered accountant. As Muhammad recalled, participants were observed and assessed from the first one hour and 15 minutes of the competition, in which they analysed a business case and prepared a business presentation with probable solutions to turn a financially distressed company around. Next, the participating teams were divided into four rooms to present their business plans to a panel of judges who are representatives of the Authorised Training Employers of ICAEW. Four best presenting teams from the respective rooms were then selected for the final round with a quiz to test the finalists’ general business knowledge. “It was ultimately great teamwork which helped us win the challenge,” said Tyron, adding that each member had a unique role to play without which their victories would not be possible. Tyron was mainly working on the presentation slides while Muhammad and Anthony were the analysts. Jeffrey was the main presenter and Albert, being the eldest of the team immediately took up the leadership role to allocate the work according to each member’s strength. Besides teamwork, Albert added that strategies were equally important especially in the finals. “There were a total of 20 questions for the four finalist teams to answer. The fastest team to press the buzzer would get to answer the question. Should the team answer correctly, it would be awarded with a point while the other team would be deducted by a point. However, should the team get the wrong answer, it would receive a penalty of one point and the question would be opened to the other three teams,” explained Albert. “The competition helped boost my confidence in public speaking,” quipped Anthony, who is also a Sin Chew Scholarship recipient at Sunway University. He was grateful to the Sunway University Business School lecturers at Sunway who have provided holistic teaching of practical business knowledge that he was able to apply instantly in the competition. The biggest take-away for Jeffrey from this competition was an experience of working under pressure. “I believe the main factor of winning the challenge was keeping calm. Albert was good at this, and by keeping our heads clear, we were able to remain analytical in handling various challenges,” said Jeffrey. In addition to a trip to London, the winners were also awarded employment or internship opportunities with one of ICAEW prestigious Authorised Training Employers. Their achievements add to Sunway University’s and Sunway College’s many accolades. The champions are looking forward to their trip and hoping to bring more prizes home to make the country proud.